Marianne Trudel is a multi-talented pianist, composer, improvisor, and arranger. At once energetic and passionate, her music cross-cuts a wide swath of musical interests. As a performer, she pursues an active career in a variety of settings ranging from solo performance to duo, trio (TRIFOLIA), Marianne Trudel 4 + Ingrid Jensen, septet, and large ensembles. She has presented her music in various countries: Canada, United States, Mexico, France, Spain, Germany, the Netherlands, England, Scotland, Italy, Hungary, Lituania, and China. She has published 6 recordings as a leader, all having garnered rave reviews. Her latest album, La vie commence ici — Marianne Trudel featuring Ingrid Jensen (Justin Time Records 2014), was nominated for a Juno Awards, as well as finalist at ADISQ 2015 and at Prix Opus 2015 (Quebec). Her trio album Trifolia-Le Refuge was also Juno nominated (2014) and was awarded the Prix Opus 2013 (Quebec) for the best jazz album of the year. She has shared the stage with many international artists, among others, in jazz and improvised music: Chucho Valdes, Mark Feldman, Tony Malaby, David Liebman, Mark Dresser, Kenny Wheeler, Ingrid Jensen, Hamid Drake, William Parker, Mark Helias, George Lewis, Muhal Richard Abrams, Jean Derome, René Lussier, and Karen Young. In chanson française and world / traditional music: Charles Aznavour, Lena Chamamyan, Farida, Naseer Shamma, Charbel Rouhana, Marcel Khalifé, Juan Carlos Caceres and Laura Risk. Marianne Trudel also presented concerts with the Montreal Symphony Orchestra, the Quebec Symphony Orchestra and the Violons du Roy (Quebec). She has composed and arranged for : Violons du Roy (Quebec), the American composers Orchestra (NYC), the Henri Mancini Institute Orchestra (Los Angeles), the Orchestre national de jazz de Montreal, the chamber music ensemble Arkea (Montreal), Oktoecho (Montreal) and for Radio-Canada (Première Chaîne). 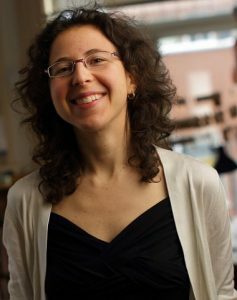 Her previous studies have included a Master in Ethnomusicology (Université de Montréal), a Bachelor in Jazz Performance (McGill University), and numerous workshops in North America and Europe (American Composers Orchestra-NYC, Banff Centre for the Arts, Vancouver Creative Music Institute, Le Tango- Paris). Since 2006, Marianne Trudel has been teaching harmony, arranging and jazz piano at Cegep Saint-Laurent in Montreal. Marianne Trudel est pianiste, compositrice, improvisatrice, et arrangeure. Sa musique, puisant au carrefour de plusieurs influences, témoigne de son regard ouvert sur l’univers infini de la musique. Énergique et passionnée, elle poursuit une carrière des plus actives, ici comme à l’étranger, donnant autant des récitals en solo qu’en diverses formations: duo, Trifolia, Marianne Trudel 4 + Ingrid Jensen,et grands ensembles. Elle a présenté sa musique dans nombreux pays, notamment au Canada, États-Unis, Mexique, France, Espagne, Allemagne, Anglettere, Écosse, Italie, Hongrie, Lituanie, Pays-Bas, et en Chine. Elle possède à son actif six enregistrements en tant que leader, ayant tous récolté des critiques élogieuses dont « La vie commence ici – Marianne Trudel 4 + Ingrid Jensen », nominé aux Juno Awards (2014), ADISQ 2014 et Prix Opus 2014 puis Trifolia-le Refuge, Récipiendaire Prix Opus 2013, nominé aux Juno Awards 2013. Récipiendaire de nombreux prix et mentions, Marianne Trudel a réalisé plusieurs projets démontrant un sens aiguisé de la créativité. Parmi les figures internationales avec qui elle a partagé la scène, mentionnons en jazz et en musiques improvisées: Chucho Valdes, Mark Feldman, Tony Malaby, David Liebman, Mark Dresser, Kenny Wheeler, Ingrid Jensen, Hamid Drake, William Parker, Mark Helias, George Lewis, Muhal Richard Abrams, Jean Derome, René Lussier, et Karen Young. Puis, en chanson et en musiques du monde: Charles Aznavour, Lena Chamamyan, Farida, Naseer Shamma, Charbel Rouhana, Marcel Khalifé, Juan Carlos Caceres et Laura Risk. Marianne Trudel a également partagé la scène avec l’Orchestre symphonique de Montréal, l’Orchestre symphonique de Québec et les Violons du Roy (Québec). Dans le créneau de la composition, elle a composé et arrangé entre autres pour les Violons du Roy (Québec), l’American composers Orchestra (NYC), le Henri Mancini Institute Orchestra (Los Angeles), l’Orchestre national de jazz de Montréal, l’ensemble Arkea (Montreal), Oktoecho (Montreal) ainsi que pour la Première chaîne de Radio-Canada. En plus de nombreux stages de perfectionnement (American composers Orchestra, Banff Centre for the Arts, Vancouver Creative Music Institute) le parcours de Marianne Trudel comprend une formation en piano classique, un baccalauréat en piano jazz (Université McGill), et une maîtrise en ethnomusicologie (Université de Montréal). Depuis 2006, Marianne Trudel enseigne l’harmonie jazz, l’arrangement et le piano jazz au Cégep de Saint-Laurent (Montréal). Guitarist, multi-instrumentalist Daniel Fischlin is a core member of the Silence Collective, the group of improvisers associated with the independent music venue Silence, and a founding member of the Canadian improvising band the Vertical Squirrels. In those roles he has played with a range of performers including Douglas Ewart, Jesse Stewart, Jane Bunnett, Larry Cramer, Dong-Won Kim, Il-Dong Bae, Jeff Cairns, Jeff Bird, Matt Brubeck, Ben Grossman, and Ken Aldcroft, among others. Fischlin was especially active in the early music scene in Montreal, as a founding member of the acclaimed group Musica Secreta (along with Hank Knox,Valerie Kinslow, Suzie Leblanc, and Betsy MacMillan), and as an occasional player in the Studio de musique ancienne de Montréal (SMAM) under Christopher Jackson and Réjean Poirier. During this period he was heard as both a performer and composer on CBC, and was a founding member, with composer Alan Belkin, of the Composer’s Concert Society, devoted to promoting new music by young Canadian composers played by young Canadian musicians. 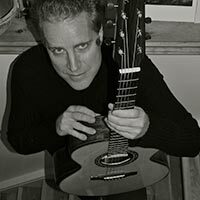 As a classical guitarist he performed world premieres of work by Andrew P. MacDonald and Chan Ka Nin. 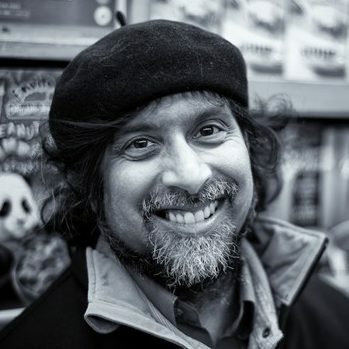 Ajay Heble is Director of the International Institute for Critical Studies in Improvisation and Professor of English in the School of English and Theatre Studies at the University of Guelph. 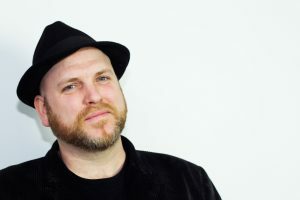 He is the author or editor of several books, and a founding co-editor of the journal Critical Studies in Improvisation/Études critiques en improvisation ( www.criticalimprov.com ). He is also Project Director for Improvisation, Community, and Social Practice, a large-scale Major Collaborative Research Initiative, funded by the Social Sciences and Humanities Research Council of Canada. As the Founder and Artistic Director of the Guelph Jazz Festival, Heble has jolted the citizens of Guelph into an appreciation of improvised and avant-garde music and delighted aficionados from around the world with his innovative and daring programming. Under his visionary leadership, the Festival—winner of the prestigious Premier’s Award for Excellence in the Arts (2010), and a three-time recipient of the Lieutenant Governor’s Award of the Arts (1997, 2000, 2001) —has achieved a rock-solid international reputation as one of the world’s most inspired and provocative musical events. Recent projects include two new books both published in 2013 by Duke University Press: People Get Ready: The Future of Jazz is Now (co-edited with Rob Wallace), and The Fierce Urgency of Now: Improvisation, Rights, and the Ethics of Cocreation (co-authored with Daniel Fischlin and George Lipsitz). As a pianist, he has released three CDs: Different Windows, a live recording of improvised music with percussionist Jesse Stewart (on the IntrepidEar label) and two recordings with his improvising quartet The Vertical Squirrels: Hold True / Accroche toi (on Ambiances Magnétiques) and Winter’s Gate (on Barcode Free). 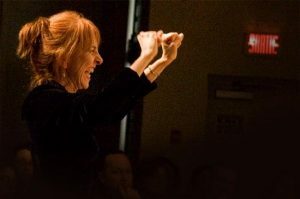 Kathy Kennedy is a certified instructor of Deep Listening (a meditative practice developed by composer Pauline Oliveros), and has taught singing privately for over twenty years, and voice to actors and teachers as well. She teaches music as well in the Faculty of Music at Concordia University. She is a well known figure in sound art and new media internationally, and her large-scale works have been performed internationally. She hosts a wide variety of group singing events from medieval to pop songs to noise choirs. Kathy Kennedy est chanteuse et instructrice certifiée en Écoute Profonde (une pratique en méditation développée par la compositrice Pauline Oliveros) basée à Montréal. Elle enseigne la musique à la Faculté de musique de l’Université Concordia et donne des leçons privées de chant et de voix depuis plus de vingt ans. Elle est bien connue sur le plan international dans les domaines de l’art du son et de nouveaux médias et ses oeuvres à grande échelle ont été interprétées au niveau international. De plus, elle anime une grande variété de chorale allant de la musique médiévale au pop et les chorales de bruit. 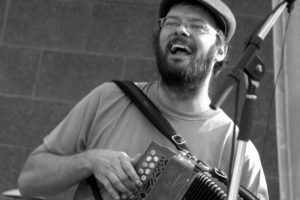 Robin Servant is a musician with a passion for traditional musics, improvisation, and composition. He has worked in many traditional ensembles (Tord-Vis, la Baratte à Beurre, la Marée montante) and also in improvised music groups (Brugir, GGRIL). He tries to make connections between popular traditions and contemporary musics. His work is organized around 2 axes: sharing the experience and experiencing the moment. With Du souffle et de l’espace, he explores the acoustic of the places he visits by making them vibrate with his accordion and electronics. Robin Servant est un musicien passionné par les musiques traditionnelles, l’improvisation et la composition. Actif au sein de plusieurs groupes de musique musique traditionnelle (Tord-Vis, La Baratte à beurre, la Marée montante) et de musique improvisée (Brugir, GGRIL), il cherche à tisser des liens entre les traditions populaires et les musiques actuelles. Son travail s’organise autour de deux axes: partage de l’expérience et expérience de l’instant. Avec Du souffle et de l’espace, il explore l’acoustiue des lieux qu’il visite en les faisant vibrer avec son accordéon et divers traitements électronique. Jesse Stewart is a composer, percussionist, visual artist, researcher, and educator. His music has been documented on over twenty recordings including Stretch Orchestra’s self-titled debut album, which was honoured with the 2012 “Instrumental Album of the Year” Juno award. He has performed and/or recorded with musical luminaries including Pauline Oliveros, Hamid Drake, William Parker, Joe Mcphee, David Mott, Dong-Won Kim, and many others. His music has been performed at festivals throughout Canada, in Europe and in the United States and he has been widely commissioned as a composer and artist. His writings on music and art have appeared in such journals as American Music, Black Music Research Journal, Contemporary Music Review, Intermedialities, and in numerous edited anthologies. Stewart is a professor of music in Carleton University’s School for Studies in Art and Culture and an adjunct professor in the Visual Arts program at the University of Ottawa. In 2013, he received Carleton University’s Marston LaFrance Research Fellowship. He has also received numerous teaching awards including a Carleton University Teaching Achievement Award, the university’s highest honour in recognition of teaching excellence. In 2014, he was named to the Order of Ottawa. Musical Improvisation at Land’s End is made possible through the generous support of its friends, sponsors, and partners: Musagetes Foundation, Corner of the Beach Historical Society / La Société Historique de Coin-du-Banc, and Festival Musique du Bout du Monde. Musical Improvisation at Land’s End / Coin-du-Banc en Folie!